Times didn't used to be published for PBP, so the Vedettes/ Randonneurs / Tourists were essentially Gold/ Silver/ Bronze. Club reliability trials often have different start times, and CTC distance and time rides had a series of grades as well. If the different time groups for PBP had different qualifying times, then we might see gradations in Audax times, but there's just a single qualification time for all three groups. As someone who's frequently lanterne rouge, I can confirm there is also competition for this prestigious place. On a recent 100, I punctured in the first mile, and found that my mini-pump was mini, but didn't really qualify for the name pump. I limped back to the start, used the track pump in my car, got directions to a bike shop, bought my first ever CO2 inflator*, and punctured again in two miles. After that, no more issues. At half distance, I was advised at the control that two other riders were very offended that I was jeopardising their traditional role as tail-end charlies. Luckily I caught and passed them before the end, and peace was restored. Free beer for all finishers is the solution to the OP's dilemna. That is certainly not within my budget unless riders appreciate Tesco economy dish-water lager at AVB 1.2%. Though I have considered commissioning the Fixed Wheel brewery to provide a few casks of their finest cycling themed ales. In fact the brewer would probably be prepared to brand a beer 'The Kidderminster Killer - AVB 8%', 'Audax Ale' or 'Brevet Beer'. For non-beer drinkers, some fine apple juice from local orchards would be the alternative. And before any over regulatory zealot makes a comment, there is an on-licence for alcohol at my GHQ. If car parking was not an issue, I would be prepared to start and finish events from the local Bathams pub with a beer token handed to all entrants. I toyed with the idea of giving all riders* a beer token at the finish (brewery) but decided it would be easier to let people buy their own drinks and better not to add £3 to the entry fee. Tea, coffee, water and squash are free, anything else you have to pay for. *not just finishers but any DNFs who return to the venue as well. 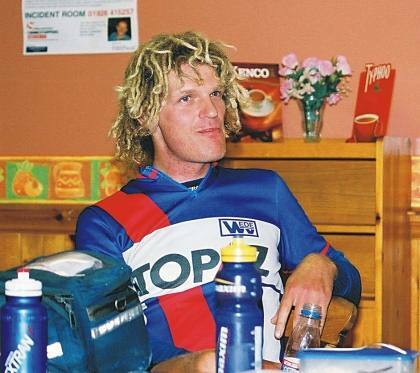 There was a brewer on LEL 2001. Wim Van Der Spek later settled in Little Valley near Mytholmroyd. 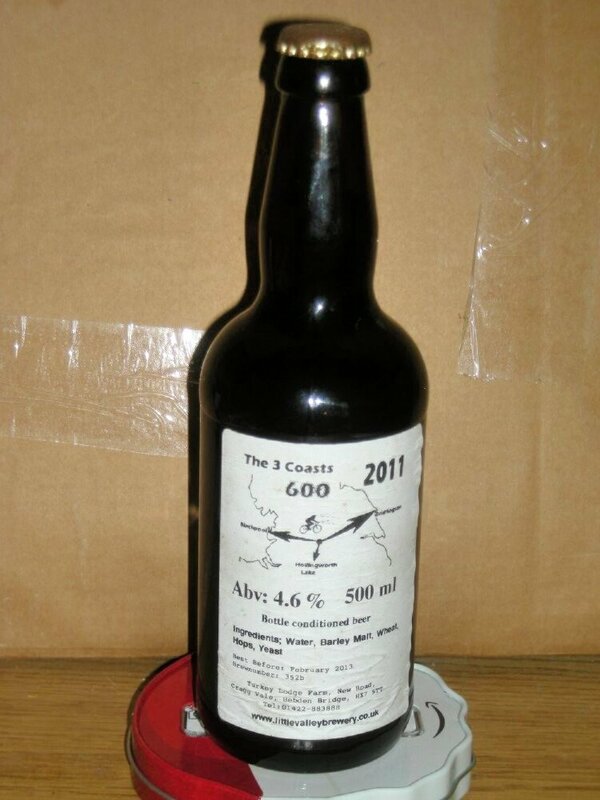 So one of the Three Coasts 600s had a special beer brewed for it, and we got a bottle each. One of the small kindnesses which Chris Crossland is known for. There must be a picture of the label somewhere, the best I can do is a link to a picture of Wim at the Carlisle Truck Stop on the LEL by Julian Beach. He's a big bloke. I recall pointing him out as the best wheel to follow to a French rider called Jean Luc Monier. I remember that his girlfriend had a Morris Minor with LEL in the registration. There are still links to various albums. I like them, as I have a wide knowledge of events such as LEL 2009, but accounts get closed, and there's a lack of captioning. Personal opinion, but if I were an organiser I wouldn't be encouraging people to drink (by giving them a beer token) before some would be driving home. Finishing at a pub and letting people make their own choices is fine. But providing people with a pre-paid token is just the other side of the line for me. I'd be interested in a study in whether drinking at the end of a long distance ride has a greater effect on blood/breath alcohol levels and reaction times compared to the same quantities of booze when normally hydrated and rested. I'd certainly be up for participating in such a study! That's was part of my reason for not going through with it. There was free beer at the overnight on the Three Steps to Severn 600 (and I think at the end, but I was driving). It was generic supermarket stuff, but it was a nice gesture. I've done quite a bit of experimentation with alcohol within, and at the end of Audaxes. Red wine seems to be the best knockout drink for sleeping at controls. It takes about twice as much beer as normal to reach intoxication at the end of PBP or LEL. The alcohol seems to be metabolised from the system quickly, and there's a lot of adrenalin about. Driving after a long Audax is a very bad idea. I drank after the Daylight 600 when Heather was due to come in about 10 hours later than me, as knocking myself out in order to get some solid sleep was a good idea. Very true in terms of the drink and drive problem. Bottled beers can be taken home. So one of the Three Coasts 600s had a special beer brewed for it, and we got a bottle each. John I appreciate your tactful reference /\above/\ to the undeniable fact that it was absolute pish. I'll be attempting to give it away again Saturday week on the Venetian Nights. You do realise that older/heavier/less well maintained bikes have a speed penalty which will make it easier for you to ride less fast for the same effort? Or you could add unnecessary luggage? It's not RUSA at all. There was a lot of RUSA discussion at the time the recognition scheme started, along with a fair bit of tutting. In the end, there is no practical way to stop a separate organisation from doing this sort of thing. There was a lot of RUSA discussion at the time the recognition scheme started, along with a fair bit of tutting. In the end, there is no practical way to stop a separate organisation from this sort of thing. Years later, nobody in the mainstream randonneuring community in the US seems to pay any attention to it other than Jan Heine and maybe few of his pals, so the idea seems to have somewhat withered on the vine. I've not seen anything like that, but I wouldn't like it either. A prize for the last back within the allotted time would be fun. In fairness there was a beer for lantern rouge last time (and won by a club mate who had a heroic adventure!). Although it wasn’t announced until someone asked about it. I have no objections to that ‘prize’. It is of course the tail end where most of the interesting stuff happens! As po-faced teetotaller on your ride I think you made the right call. However I'm pretty sure my wife, who was at the finish to meet me, would disagree quite strongly. By the way, I won. I won't bother explaining the complex handicapping system. Trust me. I won.